BET Networks Announces First Wave of Its Star-Studded STAPLES Center Concert Line-up for Its Culture-Defining Seventh Annual BET Experience at L.A. LIVE Presented by Coca-Cola® | Viacom Inc.
NEW YORK--(BUSINESS WIRE)--Jan. 30, 2019-- BET Networks, an entertainment powerhouse and world-class player in the live experiences space, announces first wave of today’s hottest artists that will take STAPLES Center stage at the 7th annual BET Experience at L.A. LIVE presented by Coca-Cola® taking place Thursday,June 20- Sunday, June 23. On Friday, June 21 the star-studded line-up includes Nicki Minaj, Lil Wayne, Tory Lanez, Trippie Redd and Bri Steves. 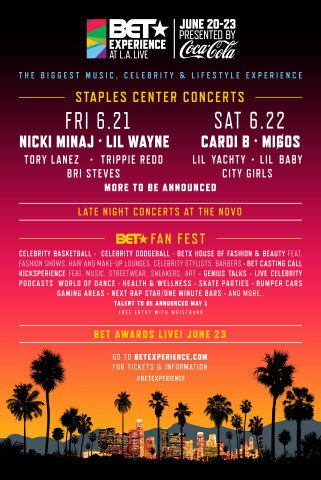 On Saturday, June 22Cardi B, Migos, Lil Yachty, Lil Baby and City Girls take the stage to close out the BET Experience STAPLES Center concerts. Additional dates and performers will be announced soon. Opportunity for media to apply for BET Experience press credentials will be announced at a later date. BET Networks, a subsidiary of Viacom Inc. (NASDAQ:VIA)(NASDAQ:VIA.B), is the nation's leading provider of quality entertainment, music, news and public affairs television programming for the African-American audience. The primary BET channel is in nearly 85 million households and can be seen in the United States, Canada, the Caribbean, the United Kingdom, sub-Saharan Africa, France and South Korea. BET is the dominant African-American consumer brand with a diverse group of business extensions including BET.com, a leading Internet destination for Black entertainment, music, culture, and news; BET HER, a 24-hour entertainment network targeting the African-American woman; BET Music Networks - BET Jams, BET Soul and BET Gospel; BET Home Entertainment; BET Live, BET’s growing festival business; BET Mobile, which provides ringtones, games and video content for wireless devices; and BET International, which operates BET Networks around the globe. BET Networks, an entertainment powerhouse, once again brings the BET EXPERIENCE AT L.A. LIVE (BETX), June 20 - 23, 2019 presented by Coca-Cola®. This four-day event will be filled with music concerts taking place at The Novo by Microsoft and STAPLES Center; the BET Fan Fest at the Los Angeles Convention Center including seminars, celebrity basketball games, celebrity meet & greets; and other special interactive events. The weekend will be capped off with the “BET Awards” on Sunday, June 23, 2019 at Microsoft Theater.